Learning Calligraphy, quirky or otherwise…. These days I mostly get enquiries from people wanting to know how to learn calligraphy, my answer is to point them in the direction of CLAS, who provide a comprehensive list of accredited teachers. I also tell enquirers to visit Scribblers who advertise calligraphy courses in copperplate, roman capitals, italic etc. Janet Smith at Oakleaf Calligraphy also provides an online learning course. It is no good asking me to teach you… I am entirely self-taught, which means I have probably taught myself some appalling bad habits. I wish I had learnt properly from the outset, as it would probably have been quicker, and cheaper. I learnt copperplate calligraphy from a book – Mastering Copperplate Calligraphy by Eleanor Winters and I taught myself quirky calligraphy from following the advice in Lisa Engelbrecht’s wonderful book – Modern Mark Making. 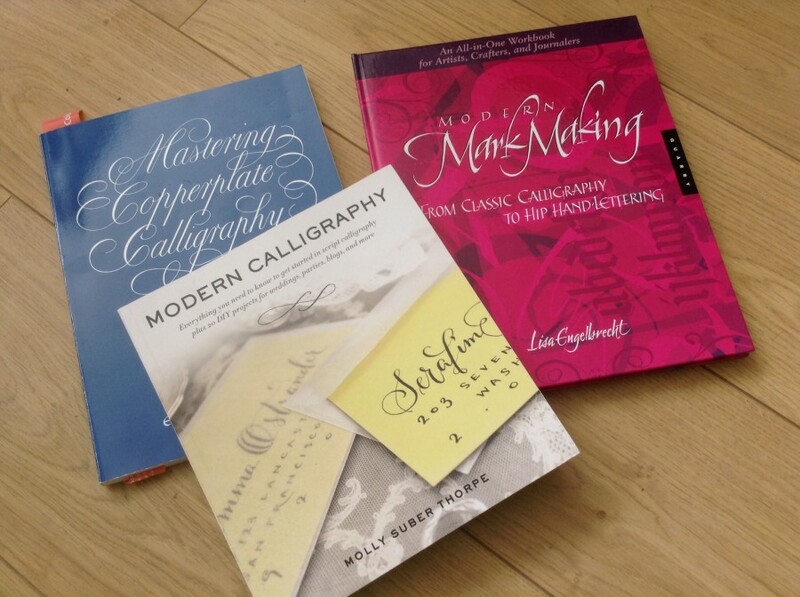 I Recently purchased Modern Calligraphy by Molly Suber Thorpe – which is a superb book covering everything you need to know about writing quirky modern calligraphy… it has a great projects section as well, which ranges from how to write on chalkboards to making water colour gift tags for weddings, parties and special occasions. I usually buy most of my supplies from Scribblers, I mostly use a Gillott 303 nib… but to start with I used a 404 because a 404 is less flexible and therefore easier to control. The nibs from Scribblers are HERE. When I started learning copperplate I did use an oblique pen holder, but I now only use straight pen holders… all pen holders are HERE. When starting out there’s no harm in trying a straight and an oblique just to see which you prefer, I like short pen holders like the school pen holder. I am cheap and cheerful 🙂 For general calligraphy and practice I use Higgins Eternal permanent black ink; for ‘best’ I use Schmincke calligraphy gouache. Some would imagine that the calligrapher is neat, tidy and organised… I wish I was. My desk always looks like a bomb has hit it… don’t work like this, it is hellish and I never know what I’m doing…. 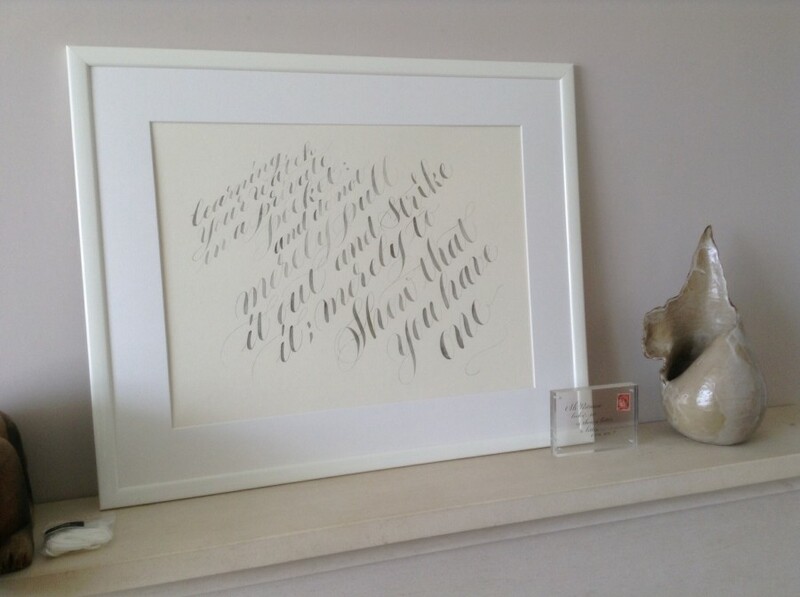 Meanwhile, my mantelpiece is tidy…. This entry was posted in Calligraphy and tagged Calligraphy books, calligraphy quotation, calligraphy studio, copperplate, learning calligraphy, learning calligraphy uk, modern calligraphy, Oakleaf Calligraphy, quirky calligraphy on April 1, 2014 by Scarlet. Thank you for this behind-the-scenes look. I know two cats who would love to have a go at tipping those pen holder jars on your desk! PS: I will soon attempt to mount and frame the cat puzzle. Ha! Yes! My old cats had to be shut out of any room I was working in… but they still managed to get in and put their paws over everything… the dog was even worse… one shake of his coat on a wet day and the whole room would be besplattered. I still miss them all. My start in the world of calligraphy was in 1955 (yes, I am incredibly ancient) in Foyles bookshop in the Charing Cross road, London. I just browsing around, not looking for anything in particular when I saw a poster advertising “Poster Work for Everyone” by somebody whose name I have forgotten. The poster was lettered in such a beautiful script that I thought “I would love to be able to do that”. So I went to the counter and asked the assistant if he could recommend a good cheap book to start me off. A man standing nearby, dressed in an effeminate manner with a large floppy hat and an enormous cravat sidled up to me, and putting his hand on my shoulder, said in a posh voice “Darling, you simply must buy a copy of my book. There’s one in the rack, I’ll fetch it for you”. He returned with a slim green volume called “Lettering for Brush and Pen”, a bit tatty because it was pre-owned as they say. “Here you are, Sonny-Jim, ” he said “I will give you this, and I hope you will learn a lot from it”. With that he paid the assistant half-a-crown (2s : 6d) and flounced out of the shop with a wave of his hand. I said to the assistant “He’s a queer one isn’t he?” He replied “Oh, he’s always in here. That’s Quentin Crisp you know”. I looked at the book and sure enough it was written by him. After I learned from that book I moved over to “proper” Calligraphy. That man, who I had never heard of and never saw again, put me on the right road to fame and fortune! Oh, so you are awake then. I will put a picture of it on my blog when I get a minute. If you go to my page and click on about me you will see a picture, albeit very small of that book nestling amongst my other treasured ones. I see it – Lettering for Brush and Pen! Please do a review! I need to go to bed… still trying to sort out my body clock because of losing an hour. I just noticed the date. No, my comment is not a joke; it’s true, I swear by my Swan Calligraph Pen that if I’m lying may the pens bladder burst and flood my pocket with ink! Google “Quentin Crisp” and see. I did, Keith! I want this book too! And I had forgotten the date! I have a creaky back and Christ knows what I’ve done to my shoulder…. but Keith’s tale has perked me up! I love the Quentin Crisp tale! Do you think he’d been hanging around there for weeks waiting for someone to show an interest in something calligraphic?!! Scarlet thank you so much for the mention of my courses. At the moment I’ve Foundational and Italic, but I’m thinking about adding a pointed pen one, because it’s such good fun and is often what people want from their calligraphy these days. And your desk – I feel your pain! The stuff piles in until I’m working in a 3″ square of space – ridiculous! Yes, an online pointed pen course sounds like a good idea, it is growing in popularity… I have thought about it myself, but… I think I’m just commitment-phobic! Your work space is fantastic! Look at all that space and light! The equivalent in Manhattan would cost you many, many thousands of dollars per month. Who ever said an artist was organized? I’ve never heard them accused of that. To hell with food. Who needs food when you can have all that LIGHT and SPACE with which to create? You can starve your belly but please don’t starve your soul. Ha! I will get the shakes if I don’t eat…. I will have something bohemian, like half a loaf of crusty artisan bread and a lump of cheese and eat it straight from my rustic bread board. I may even have grapes. Meanwhile, I will never get round to reading YOUR post if I don’t get a wiggle on… what is this ‘Go bag’ ? I need to know… and I still need a sandwich! Give me a moment and I will be over to yours for a read…. At your leisure. Don’t ever, never, never feel obligated to read a post. I used to do that a lot but I stopped and now I’m happier. I read the first few lines in my reader and now I MUST know about your bag! Sx – Onions and garlic? Now you’re talking! I love them, especially covered in nice thick creamy custard, yum! Has the sand storm reached Devonshire? Thank you for asking Mr Lax! Devon has got off lightly… I think Z and Ms Roses might be suffering in East Anglia. In the West Country we have rain, as per. It’s lovely having space… but really that means having more room to make a mess! Crikey, where did you do your work in a caravan?! 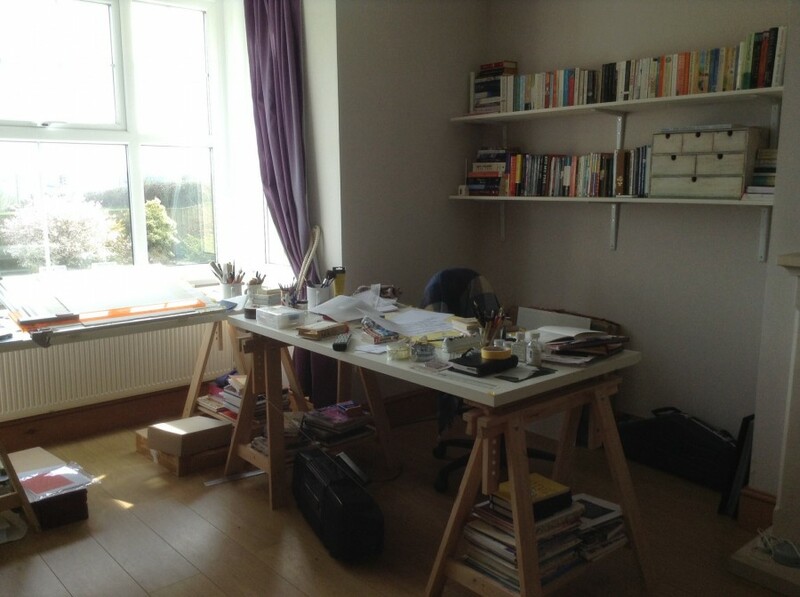 P.S My tables were £50.00 each from Ikea… I think they still do them… and you can mix and match work tops and table legs.